Can governments and banks be trusted with the money power? As governments around the world struggle to manage their soaring debt burdens, the wisdom of E. C. Riegel rings ever more true. The masters of the political debt-money regime are pressuring Cyprus to confiscate part of the savings of their citizens, and Greece and other countries to impose budgetary cuts that burden the poor and middle class. Argentina wants to grab their people’s savings by nationalizing their pension funds. All the while, the purchasing power of national currencies shrinks as governments inflate them to enable deficit spending. Riegel’s call for monetary freedom must no longer be ignored. –t.h.g. Old Liberty Bell rang out the political freedom that we cherish. But unless we learn how to make freedom ring the cash register, bureaucracy will ring down the curtain on our liberties. What is the strange power that makes the government at Washington grow stronger and our state and local governments grow weaker while the people suffer the torment of war and the travail of insecurity and the shadow of dictatorship falls across the land? It is the same power that oppresses the people of all the world — the political money power. wealth diminishes and more of our liberties vanish. Inflation that threatens to bring chaos is just around the corner. As our sons bleed and our mothers weep, the same grinding power throws its pall over other lands. Yet our chains are paper – paper money that, through our ignorance, binds us to the treadmill of our own destruction. We can be masters of our destiny; we are all powerful, if we but realize it. In each of us resides the power to assure liberty, prosperity, security and peace. In each of us lies the money power, which, when springing from us, is democratic and virtuous; when springing from government is authoritarian and vicious. As we liberate our inherent money power we curb the political money power, for the more we use our self-created money, the less we need political money. Thus we defeat dictatorship. Thus we reconstruct the shattered world on a free democratic basis. Thus we save civilization. Parchment freedoms are but taunts and mockeries without money freedom. A people dependent upon their government for money is a subject people regardless of the form of their government. No people can declare their independence and govern their government unless they assert their money freedom. A government that is not dependent upon its people for money supply is a tyranny regardless of its professions. Government must be made to beg the people for money; the people cannot be sovereign while petitioning government for money. The citizen must command both government and business through his money power. Political democracy is a delusion without economic democracy and economic democracy can function only through the power to issue money – the power to ring the cash register – the power to support and the power to withhold support. To prevent political dictatorship the citizen must himself be a dictator. To prevent centralization of power, power must be reserved by the people. Money power is sovereignty; without it democracy is impossible. From Money Freedom, organ of The Private Enterprise Money Movement. More monetary wisdom from E. C. Riegel, including his book, Private Enterprise Money, can be found at http://www.newapproachtofreedom.info/, and via my website https://beyondmoney.net/. — Thomas H. Greco, Jr. I know we’re all overloaded with information these days, so I’ll keep this brief. Summers in Tucson can be a challenge. June is the hottest (and driest) month with daytime high temperatures averaging around 100 degrees, but with many days 5 to 10 degrees hotter than that. July can be just as hot, but by then we can expect the start of the eagerly awaited summer monsoons. These are not the sustained rains that fall in the tropics, but (usually) brief thunderstorms that provide some relief from the blazing sun and oppressive heat, and we can always count on the temperatures dropping by thirty degrees or more overnight. Like winters in the north, summers here are a time of reduced activity and indoor pursuits, like reading. A couple of the books that I’ve read recently that I highly recommend are David Sloan Wilson’s, Evolution for Everyone, and Malcolm Gladwell’s, Outliers. Both of these books challenge established beliefs in a way that I find fascinating, and both tells stories that are very engaging. In March I conducted a teach-in for Move On and Occupy Tucson, presenting my ideas about The Emerging Butterfly Society, then, later in the month traveled to San Diego under the sponsorship of Activist San Diego & Women Occupy San Diego, where I gave a presentation titled, Occupy the Commons: Reclaiming Our Birthright. That was followed up with a workshop titled, Complementary Exchange Systems: Preparing to Launch, which I conducted for a small group of social entrepreneurs who are now in the process of starting up a local exchange system for their community. Also in March, I was a guest on Catherine Austin Fitts’ monthly Solari Report program on which we discussed various approaches to value exchange and investments that bypass conventional banking and financial institutions. Catherine, who was Assistant Secretary of Housing in the first Bush administration, is a knowledgeable investment advisor. See her website at http://www.solariadvisors.com/ . In April, I was invited to do a brief interview for Bloomberg TV’s program, In Business with Margaret Brennan. Later, I traveled to Philadelphia to attend the Public Banking Institute conference (see details below). May and June included another presentation at the Sustainable Tucson monthly meeting, an interview by Jay Taylor on his webcast program, Turning Hard Times into Good Times, on Voice America internet channel (download it from https://beyondmoney.files.wordpress.com/2012/05/thomasgreco20120522jaytaylor.mp3), and an interview by Marcus Matthews from London, England, on his webcast program, The Money Maverick. Public banking frees the credit potential of public revenues and then harnesses this public wealth to create sustainable, abundant and affordable credit. This credit — our credit – supports our economy and citizens if it is then used to build economic capacity (think renewable energy, sustainable agriculture, etc. — things that private banks do not fund). PBI is committed to public banking becoming a mainstay to support the new economy. As PBI matures as an organization, I expect that the scope of its mission will expand to include other more fundamental approaches to community empowerment and economic development. I continue to enjoy good health and am considering the possibility of a Fall tour of Europe and the UK to conduct workshops and presentations for groups that have been following my work and have a serious interest in the approaches that I have been advocating. Preliminary discussions have been positive but my decision will depend on booking enough stops to cover my expenses and provide a small honorarium. If your group, or some other that you know of, would like to be included, please contact me at thgreco@mindspring.com . I’d like to call your attention to some recent posts to my blog that I think are especially important. Two of these present some of E. C. Riegels most important ideas, along with my commentary on them. They are E. C. Riegel’s Money Quiz and the True Money System, and The Language of Money and Accountancy. I’m planning to post more of Riegel’s incisive writings over the coming months, so please watch for them. I also suggest that you follow the insightful work of Tom Atlee, expert facilitator and advocate for group intelligence. I’ve excerpted one of his recent articles at, What and whom do we really depend upon?. Finally, my post about Cyclos, Cyclos, worth another look?? , has elicited a number of comments, including some from the Cyclos developers. These comments contain much valuable information for those of you who are searching for a suitable software platform for your exchange system. The long-awaited English version of the commons anthology is now expected to be published in September from Levellers Press under the title The Wealth of the Commons: A World Beyond Market and State. At that time, I will be posting the text of my chapter on https://beyondmoney.net/. I think it is one of the best articles I’ve ever written, so please watch for it. One of E. C. Riegel’s most important published articles is, Money Is the Language of Accountancy, which was published in The Journal of Accountancy, the official publication of the American Institute of Accountants, in November 1945 (pp. 358-360). In this article, Riegel outlines the benefits of a proposed “Private Enterprise Money” system (which I have highlighted), explains its elegant simplicity, and shows how it can be the key to solving myriad economic, social, and political problems. The article achieves Riegel’s usual high standards of incisive reasoning and eloquent expression, but there are a few points on which I disagree. I therefore find it necessary to write and publish my critique along with it. While Riegel’s explanation of the nature of money is superb, I have some serious disagreements with him regarding the measure of value and the requirements for implementation of the mutual credit system. We now have the advantage of six decades of actual experience with clearing systems of the sort that Riegel envisioned. I also find it necessary to clarify a few of Riegel’s points. I urge the reader therefore to read both the article, which appears below, and my critique which follows it. Anyone who truly wishes to understand money and to discover the way forward toward justice, freedom, and economic democracy should study Riegel’s works starting with his book, Fight From Inflation. These can be found at http://www.newapproachtofreedom.info/—t.h.g. Proceeding from the assumption that the study and comprehension of money is an integral part of accountancy, this author explains his own conception of the function of money and credit, proposes the establishment of a “private-enterprise money” system, outlines it’s operation, and lists some of the advantages which he believes would result from the point of view of accountants, in particular, and the national welfare. Mr. Riegel, who is president of the Valun Institute in New York, describes himself as “a non-academic student of credit and money.” He is the author of several books, including a recent volume entitled “Private Enterprise Money,” which develops the proposal outlined in this article. The problem would be one of providing the means whereby trader No. 1 could receive value from trader No. 2 by the former giving the latter an order for an equal value which order would be acceptable to any trader at any time. An IOU would not be sufficient; it must be converted into a WeOU. In other words there must be a conversion from private credit to composite credit underwritten by all the participants in the trading circle. Obviously, this calls for a pact of all the traders agreeing to honor the promises of each as if issued by all. Mutual or social or composite credit is, therefore, the foundation of a money system and the device that liberates traders from the limitations of whole barter. Realizing that we have a mutual credit agreement whereunder the credit can be offset only by delivering value (selling goods or services), it is obvious that we cannot afford to admit to our money exchange as a money issuer any factor [entity, ed.] that is not engaged in the business of buying and selling. Ipso facto governments are excluded since they have no way of making good their promise which is implicit in the issue power. This explodes the delusion that governments back money. It is only private enterprisers that back money; governments merely depreciate it by freely issuing it but never backing it by over-the-counter transactions. I agree that “the essence of credit under a true money system is not to promise to pay money but a promise to receive money,” but I cannot fully agree with his proposals for b) and c). Surely, the nature of the member’s particular business must be considered, but it cannot be the sole criterion for determining credit limits. I would want each account limit to be based, at least, upon their historical volume of business, plus perhaps one or two additional factors, like their reputation and overall contribution to the welfare of the community. Also, he does not make clear that there must be some formal underlying agreement defining rights and responsibilities of membership in the clearing exchange. Regarding c), the size of the unit, it is not enough to set its initial value equal to the dollar at the time of commencement, as Riegel suggests. That is only a logical starting point, considering that dollar valuation is what we are all accustomed to. Dollars is the value “language” we understand. But unless the system unit is defined in physical terms, it will simply depreciate along with the dollar as debasement of the dollar by the monetary authorities continues. I’ve written about that before in my books. In order to maintain its value over time, the credit unit (Riegel calls it a valun) must be defined in terms of something other than the dollar. My choice of definition has long been a “market basket” of basic commodities, because that will be the most stable measure over time and is impossible for any group of entities to manipulate. I agree that the system should support itself through transaction fees, i.e., what he calls “check-clearance charges,” but if the Exchange itself has no money issuing power, how is it to cover its start-up costs? Either some up-front investment will be needed, or the exchange must be given a credit line. I favor the former as a safer alternative, but if the exchange is given a line of credit it must be strictly limited on the basis of its anticipated near-term revenues. By way of clarification, what he means is that mutual credit does not require that anyone borrow money into circulation. Thus, there is no need for the issuer of credit to sign a promissory note to a bank or anyone else, or to pay interest on negative account balances. There is however the need for each member of a mutual credit exchange to sign a general agreement that outlines the rights and responsibilities of their participation. 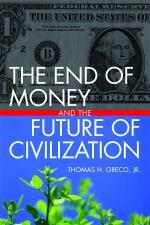 I have provide a draft of such an agreement in my book, The End of Money and the Future of Civilization. The key provision, as Riegel states, is that “no units will be issued except for value received.” That means no monetization of government debts or the inflation of credits on the basis of valueless or non-marketable assets. It is Riegel’s objective and mine to deprive government of the power to exceed its budget by debasing the currency, but Riegel’s insistence that “the government would have no issue power,” may be both impractical and overly restrictive, especially with regard to lower levels of government, like counties and municipalities. Nonetheless, government spending at all levels must be strictly limited to their legitimate tax revenues as approved by the people. Their participation in a mutual credit system must limit their credit issuing power to some small fraction of their annual anticipated tax revenues. Finally, I wish to make a point about one of Riegel’s predictions. In the final section of the article titled, Money and Reconversion, Riegel says, “The dollar must be converted, sooner or later, from its prewar power to its natural current power which will grow progressively smaller and I believe will not be arrested short of complete fade-out.” Obviously, he was wrong about the “complete fade-out” of the dollar in the post World War II era. There was, indeed, a significant increase in prices at that time, but the tremendous increase in productive capacity that America achieved during the war enabled an unprecedented flood of consumer goods to reach the market rather quickly and absorb the very large savings that people had accumulated. While dollar debasement has continued up to the present day, and the purchasing power of the dollar has continued to decline, the monetary authorities have found many ways to forestall an acute crisis—until recently. Now, concerted action can no longer be deferred. The usury-debt-money system must be transcended, the credit commons must be reclaimed, and a decentralized and democratic network of mutual credit clearing circles is within our power to create. Riegel has provided us a torch to light our way.—t.h.g.